But it’s in her latest film, the comedy “What Men Want,” where she shows off her greatest power of all: hearing men’s thoughts. And really, is there any greater power she could want, especially considering she’s a sports agent in cutthroat, male-dominated industry? Henson plays Ali Davis – as in Muhammad Ali, the favorite boxer of her dad who trains fighters – who despite being one of her firm’s top performers, gets passed over for partnership – a position she was denied simply because of her gender. She’s angry, so during a bachelorette party she meets with a psychic (Erykah Badu) who gives her a mysterious tea, which Ali doesn’t know is laced with drugs until it’s too late. The party proceeds to a club, where Ali slips, hits her head on the bar and wakes up in the hospital. She immediately knows something’s wrong because she begins hearing men’s thoughts, most of which she wishes she hadn’t heard. At first, she wants the voices to stop, but the psychic can’t remove the power. When Ali’s personal assistant Brandon – a role played extremely well by Josh Brener – says she should channel her power for her advantage, she embraces going where no woman has gone before. Ali sets her sights on doing the one thing that would make her a partner: sign the projected top pick in the NBA Draft. The problem: her boss, Nick (Brian Bosworth), believes that men simply don’t connect well with Ali, whose outgoing and aggressive personality intimidates them. 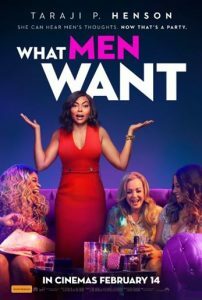 Now, Ali knows what men are thinking, which is crucial since the key to signing Jamal is convincing her outlandish father Joe Dolla – played by Tracy Morgan – that she’s the best agent for the job, despite Joe wanting his son to sign with one of Ali’s male counterparts. While Henson has done superbly in other roles, considering she won a Golden Globe as Cookie in the TV show “Empire” and was nominated for an Oscar in “The Curious Case of Benjamin Button,” comedy may be her strongest suit. Her mannerisms and snappy dialogue make any conversation funny. Though she’s abrasive and at times takes advantage of people, it’s easy to cheer for her from start to finish because she’s the underdog. Director Adam Shankman surrounds Henson with an effective cast, including her love interest (Aldis Hodge) and plenty of cameos, including Dallas Mavericks owner Mark Cuban and NBA Hall Of Famers Grant Hill and Shaquille O’Neal, who provide moments of levity during a poker game. Henson’s performance will be compared, appropriately, with Mel Gibson’s in Nancy Meyers’ 2000 rom-com “What Women Want,” in which Gibson hears women’s thoughts. Gibson and Helen Hunt powered the film to more than $374 million at the worldwide box office. Henson’s version deserves to make even more.